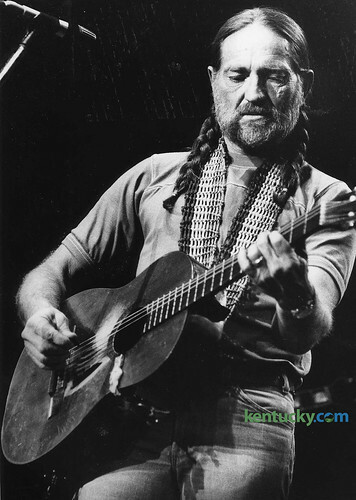 Country music singer Willie Nelson performed at Rupp Arena on May 13, 1979. The concert that night included Waylon Jennings, Emmy Lou Harris and Leon Russell. Nelson has played Rupp Arena seven times, including four years in a row from 1977 to 1980. His last appearance at Rupp was in 2000 with the Dixie Chicks, Patty Griffin, Ricky Skaggs and Vida & Joe Ely. This entry was posted on Sunday, May 13th, 2018 at 7:47 am and is filed under black and white, This Day in Willie Nelson History. You can follow any responses to this entry through the RSS 2.0 feed. You can leave a response, or trackback from your own site.